Training is fundamental to the successful development of a soccer player. 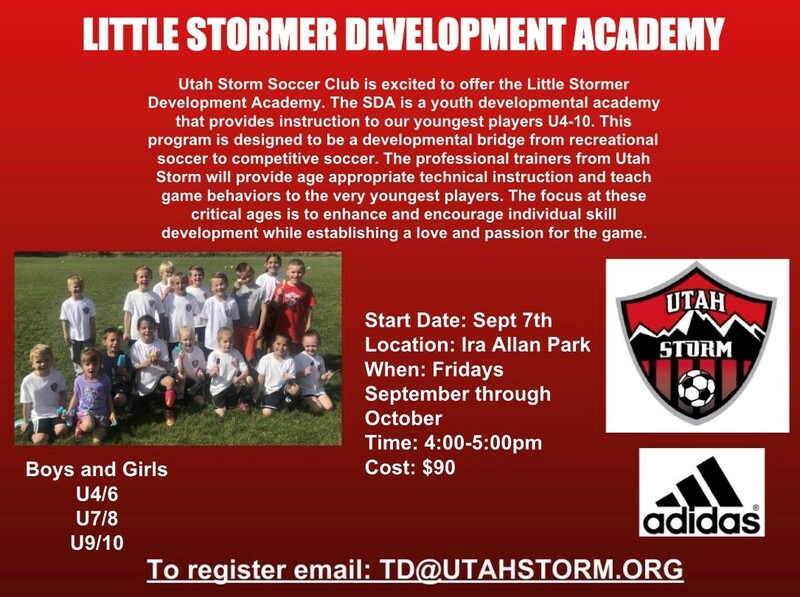 The Utah Storm Soccer Club provides a wide range of training options for the players inside and ouside the club. We provide players with additional training year round, choose the camp that is right for you, show up, work hard & IMPROVE your game! We offer camps throughout the year for players to increase specific skills or ideas: Keeper camps, Ball Mastery Camps, Finishing Camps and More! For young players (age 4 to 10 ) who are just discovering the game of soccer, we offer the Lil' Stormer Academy and our Discovery Program. Our Camps are supervised by USSF Licensed Soccer Instructors and the most important attribute is the passion for youth soccer and the development of players. Our Coaches will help you move onto the next level. Take advantage of it. We dare you! Latest Camp information can be found below, check back often for the upcoming camps! 2018/19 Winter Camps (Indoor) - Details coming soon! 2018/19 Little Stormer Academy (Indoor) - Details coming soon! 2019 Summer Camps - Details coming next Spring!